Choose your craft from among the world’s premier powerboats for the maximum in comfort, safety and performance. We offer Fountain powerboats for your Virgin Islands adventure. 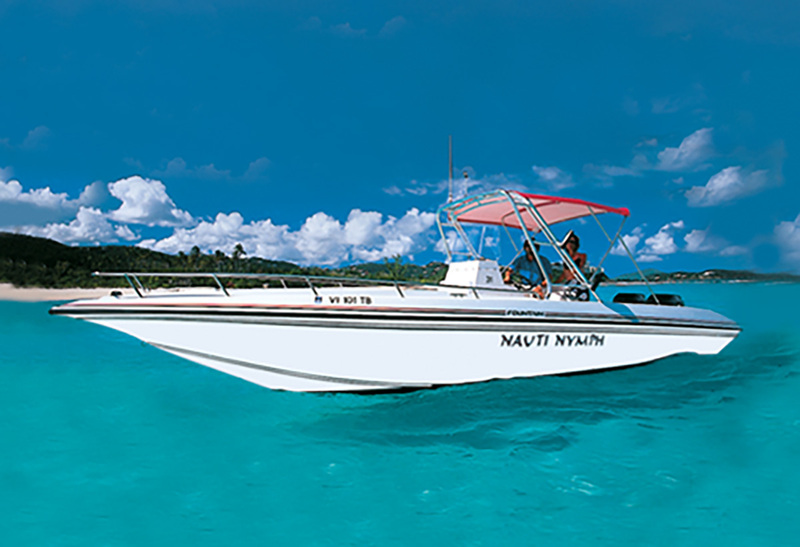 All Nauti Nymph vessels are powered by reliable and fuel-efficient twin horsepower engines. The Fountain is the "Cadillac" of the powerboating industry. Simplified elegance teams up with the highest quality and best performance. The unitized construction and revolutionary pad keel / notch transom design of the Fountain make this one of the smoothest riding, best handling and safest boats in its class. Furthermore, you will save money at the gas dock, due to the incredible fuel economy of the Yamaha engines. The 29 ft. Fountain powerboats feature a deep-V hull, large bimini tops, full instrumentation (including VHF radios), and complete Coast Guard-approved safety gear. Comfort and convenience are enhanced by fully cushioned sun decks, plush seating, freshwater showers (upon request), dry storage, built-in ice chests, and swim ladders. Fishermen will wish to take advantage of the rod holders. Charts can provide assistance with planning your itinerary. Vessel type: 29 ft Center Console with twin 150hp engines.